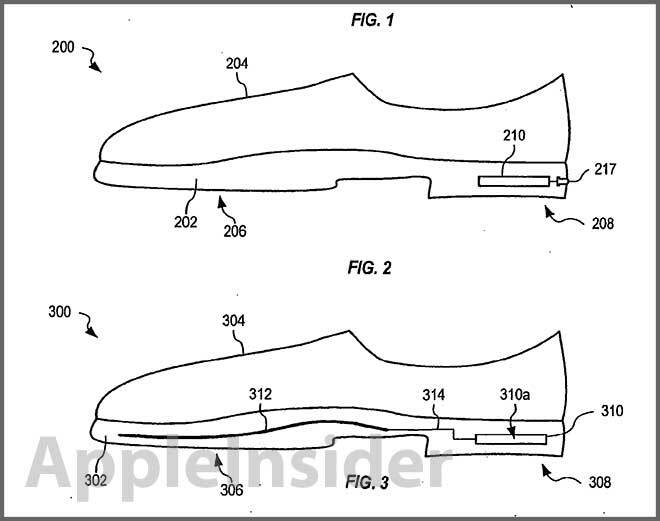 An interesting Apple patent application discovered on Thursday describes a sensor and alarm system that can be embedded into footwear, granting users a more empirical method on which to rely when deciding to replace worn-out shoes. 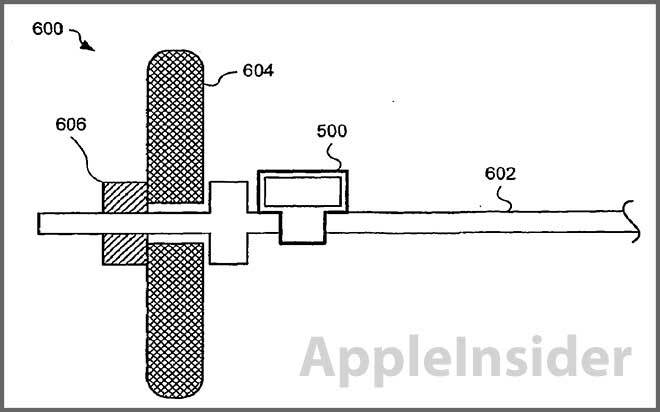 First filed with the U.S. Patent and Trademark Office in July 2012, Apple's application for a "Shoe wear-out sensor, body-bar sensing system, unitless activity assessment and associated methods" looks to make "smart shoes" that can alert owners when they need replacing. As Apple describes it, shoes not only provide comfort and protection, but also stability for feet during physical activities such as sports or training. Over time and continued use, a shoe's support decreases, thereby reducing the effectiveness of its protection. There comes a point when a "critical wear level" is reached where a shoe may not provide enough support and can in some cases actually cause foot damage. Because this level of wear may not be apparent to the user, a sensor and alarm system could be a solution to preventing injury. Illustration of system with external display. 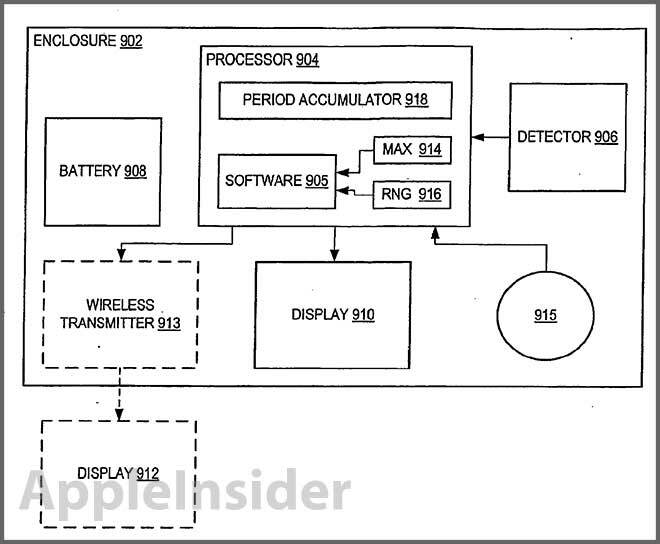 The patent basically involves three main components: a detector for sensing when the shoe wears out; a processor to measure the detector's data; and an alarm for alerting the user when a shoe is no longer stable. Sensors can be of any type, including accelerometers, pressure sensors and piezoelectric flexing sensors, among others. Data is processed through an algorithm, which can be set according to a shoe manufacturer's specifications, that determines at what point a shoe is at the threshold of failure. In one embodiment, a "unitless" activity number may be assigned to the sensed motions by the processor, which in turn generates an "activity value" based on a predetermined maximum number. The unitless system can also be applied over time by taking samples at periodic intervals. For example, if a shoe is rated for 500 hours of use, the alarm would sound after the system recorded that amount of activity. Other physical metrics not directly associated with one's shoes are also accounted for as another embodiment involves a body bar sensing component that is used to quantify the repeated movements of lifting weights. These repetitions can be processed and ultimately represented graphically on a display device. Illustration of body bar sensing detector with bar weight. Powering the system is either a built-in battery or a mechanical electric generation device, while the alarm can take the form of an LED light, speaker or display. Also incorporated in some embodiments is a wireless interface, suggesting compatibility with portable devices like the iPhone or iPad. Apple envisions the processor, alarm and other necessary electronics to reside in a shoe's heel or any other location where there is ample room for the circuitry. The sensor, or sensors, can be placed in the outsole, heel and other various locations ripe for wear-out detection. Complex system with periodic sampling processor. While an Apple-branded pair of basketball shoes may be far off, similar technology is already being used by major brands like Nike to track athletes' performance. The patent application credits Curtis A. Vock; Curtis and Perry Youngs as its inventors.